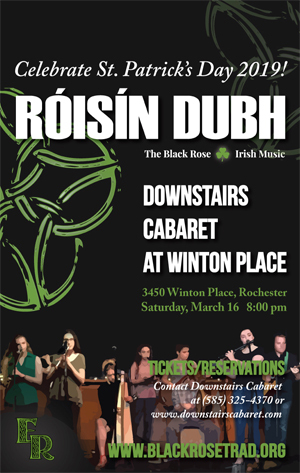 ♫ Friday, June 21: Róisín Dubh Album Release Party! Click here for the complete 2018-19 calendar. Mr. Gowman & Mr. Fraser teach brass, woodwind, and percussion lessons in grades 6-12. Click here for their weekly schedule. Mrs. Borden teaches lessons to a number of woodwind players in grades 6-12. Click here for her quarterly lesson schedule. 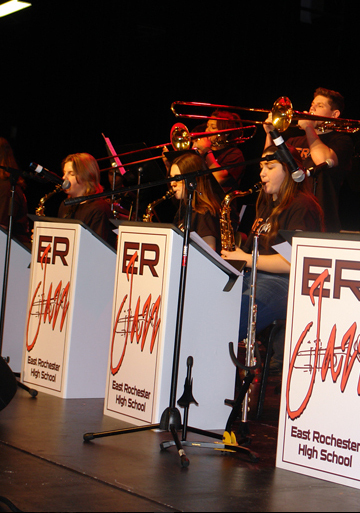 Click here to learn more about instrumental lessons, an essential part of ER's music program. Each week, each student in an instrumental ensemble will be scheduled for a lesson on his or her instrument, and the lesson schedule is posted each week on the website. Note: Students who are studying more than one instrument will have their lessons split between instruments as needed. By following this schedule, a student should not miss a class more than once a month. If the missed class does not meet all four days of the cycle, the student may miss the class only once every eight weeks. There will be work assigned during lessons, and students are expected to make up any missed work from their regularly scheduled classes. Students are graded on a scale of 1 to 10 at each lesson, and the average of this score is approximately ⅓ of the course grade. We continue to use Google classroom to share information and assignments with students and parents. We can only be as good as our equipment. Please see our Supply List for the supplies and accessories we recommend for students. All instruments should be from a reputable manufacturer and in good working condition. Need an instrument or considering a purchase? Contact us. The complete 2018-19 calendar includes instrumental and vocal music and extra-curriculars. Subject to change. All of our bands, jazz bands, and percussion ensemble receive grades and course credit. Please click here for more information. Each week, a student receives a score out of 20 for class participation. This is based on how well they are prepared on the music, and how well they are participating in the class/rehearsal. Students also receive a score out 10 for each weekly lesson, based on the same criteria. With field trips, testing, teacher scheduling issues, and other conflicts, students are normally scheduled for 7-8 lessons each quarter. This means that if a student receives perfect scores for class participation but doesn't attend any lessons, the best possible score is around a 68. The reality is that when students miss lessons they are not as proficient on their instrument, and their grade goes lower. This is tempered somewhat by the fact that performances raise students' grades. But, if a student is sick and misses the performance, that "bump" in the grade doesn't exist. Worried about grades? Don't be. In the 4th quarter of 2017, two-thirds of students in grades 6-8 received a 94 or higher, while two-thirds of high school students received a 96 or higher. Do what you are supposed to, and you will get a good grade. Mark Gowman has been the 7-12 instrumental music instructor in the East Rochester School District since 2001. Mr. Gowman is a 1995 graduate of the University of Michigan, where he received his degree in music education and trumpet performance, played snare in the Michigan Drumline under Clif Smith, and was a student of the famed trumpeter Armando Ghitalla. He received his Master's Degree from the Eastman School of Music in 2007. Read more. Faculty biography and information coming soon. Be sure to visit our YouTube Video Channel! Mr. Gowman and Mr. Fraser are typically in the office 7:30 am - 3:30 pm, and are usually with students for that entire time. You can give us a call at (585) 248-6344 , but we will not answer if we are in class or lessons. A better way to reach us is through the contact form below, which is connected to our email addresses. Other music faculty are available through the 6-12 office at 248-6350 or the elementary office at 248-6311.